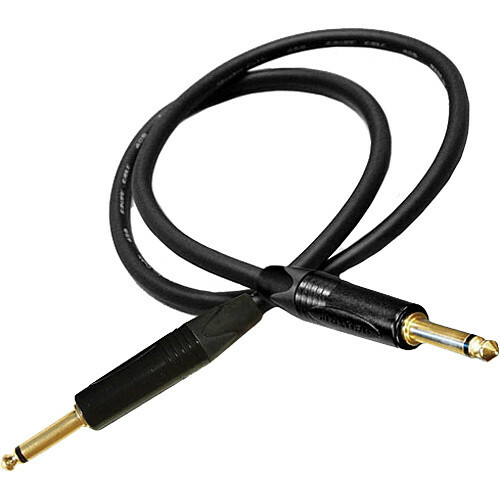 The 20' black Canare GS-6 Guitar Cable features a Canare GS-6 cable and 2 straight Neutrik Black & Gold 1/4" TS connectors. It has an 18AWG, 127-strand count oxygen-free copper wire that provides an expanded frequency response as well as added cable flexibility. Its PE insulation is designed for low capacitance and resistance. The GS-6 also features a polyethylene dielectric and a high density braid with a polyvinyl carbon sheath. The cable is hand-assembled in the USA and can be used with guitars, basses, keyboards, mixers, effect pedals and outboard signal processing gear. Box Dimensions (LxWxH) 7.4 x 7.1 x 0.7"